We believe that new life in Christ begins at salvation and is nurtured by regular Bible reading, prayer, fellowship, and service. Our growth in maturity and in Christian experience will attract other people to Christ. We believe that we have responsibility to assist people in times of need and crisis. We seek to come alongside those who are hurting and struggling in their lives. We care by bearing one anotherís burdens. The Word of God is our basis for faith and lifestyle. We study the Word as individuals and as a church. We seek to be in the Word constantly, so that it can be reflected in our daily lives. It is our understanding that God has placed us here for the purpose of extending His love to those who live in our community. We encourage those in our church family to speak to their friends about Jesus Christ and His offer of eternal life. We meet regularly for fellowship, worship, learning, and service. Only as we meet together often can we blend our gifts of service. To fellow members of our church family, we pledge ourselves to love, to care, to support, to encourage, to pray, to assist, and to disciple each other. The one and only eternal God has revealed Himself as Father, Son, and Holy Spirit. We believe in Jesus Christ as the Son of God, born of the Virgin Mary, and He is truly God and truly man and He died in our place to take the due punishment for our sin. We believe the Old and New Testament Scripture to be the Word of God, the final authority for faith and life. We believe people were created in the image of God, but through our free will we have disobeyed and separated ourselves from God. We believe one must be born again of the Spirit of God (a spiritual birth) to have peace with God. We are saved by grace through faith in Jesus Christ. We believe the Holy Spirit lives in every believer. As we yield our lives to the Holy Spirit, He will help us live as He would have us live. The more the Holy Spirit controls our lives, the more we grow to be like Christ. We believe the church should manifest Christ here on earth, make disciples, and build members up to maturity in Christ. We believe in the personal imminent return of Jesus Christ and in the bodily resurrection of the righteous to be with Him forever. The unrighteous will suffer the torment of eternal separation from Godís love. David's parents served with Avant Ministries (formerly Gospel Missionary Union) and as a result, David was raised in a missionary home in Mali, West Africa. He attended Mamou Missionary Academy in Guinea Conakry, West Africa through the 10th grade and then his family returned to the United States where he graduated from High School in Mt. Lake, MN. David continued his studies at Grace University in Omaha, NE where he graduated with a B.A.degree in Bible and Pastoral Ministries. He then studied for the Master of Divinity degree at Grace Theological Seminary in Winona Lake, IN. 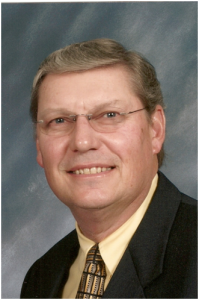 David was ordained in 1985 by the Evangelical Mennonite Brethren Conference and has served a number of churches in various denominations in Iowa, Illinois, Minnesota, Colorado, and Oklahoma. David believes wholy in Biblical, Expository, verse-by-verse preaching with practical application to Christian Living for today.